As the earliest major class of monument in the SWHS, long barrows have been interacted with by different communities at every stage of the landscape's use since their construction. In some times and places these interactions have been reverent and attentive, at other times destructive or neglectful. Long barrows have been incorporated into later barrow cemeteries, field systems, and heritage landscapes. In particular, the major restructuring of the SWHS landscape during the Early to Middle Bronze Age appears to be important in affecting the later survival of long barrows, and long barrows in turn influenced the nature of these later elaborations and divisions of the landscape. There appear to be three possible fates that befell long barrows in the Bronze Age: incorporation into field systems, often destructively, incorporation into round barrow cemeteries and/or the insertion of secondary burials, or being left in isolation. The recent excavations at WS71 and WS86 have provided insight into the later history of these monuments through the dating of the final ditch fills, primarily through the artefactual assemblages. At WS71 both the Historic England and Wessex Archaeology results suggest that the final silting of the ditch took place in the Late Bronze Age. At WS86 one of the ditch sections produced evidence for a possible recut of the ditch; however, the fills from all ditch sections were interpreted as indicating rapid and deliberate backfilling of the ditches with probable mound material, with no post-Neolithic ceramics present. The destruction was not dated but the excavators suggest it occurred during the later prehistoric to post-Romano-British periods, on the basis of the probable chronology of the overlying field system recorded through aerial survey (Wessex Archaeology 2016b). This implies a considerably different sequence of maintenance to WS71, as it appears that, unlike its southern neighbour, the ditches of WS71 were allowed to silt up gradually following their recutting, at least in the north-western part of the monument, whereas the ditches of WS86 remained relatively clear of silting prior to their infilling with apparent mound debris. Neither WS71 nor WS86 demonstrate any extant mound, although there is a marginally raised area of ploughsoil in the former location of the mound of WS71. The local group of long barrows offer a variety of states of preservation. WIL41 survives to the greatest height (4.8m) and may be the best preserved long barrow in the SWHS (Bowden et al. 2015), while WS1 and WIL30 stand at 3.0m and 2.3m respectively, and it is likely that these are close to their original heights. The levelled state of WS71 and WS86 is by no means unique even within the WHS. WIL13 attains a mere 0.7m in height, AM42 only 0.3m while AM140 and DUR76 have been completely levelled (Bowden et al. 2015), demonstrating that the levelling of a long barrow, although demanding sustained effort, is not unusual. At WOO2 the ditch showed some evidence of being recut in the Early Iron Age, with a sherd of Early Iron Age pottery immediately above the recut and seven Romano-British and four medieval sherds from the upper ditch fills (Harding and Gingell 1986). The ditch at AM42 produced Beaker pottery from a secondary fill about half-way up the sequence followed by further Beaker mixed with Collared Urn style pottery, and then Romano-British ceramics (Richards 1990, 99). The sequences at both WOO2 and AM42 appear to suggest gradual silting from an area under nearby cultivation with a manuring regime. A 1946 aerial photograph of the area around WOO2 shows traces of ridge and furrow to the north of the barrow and this would mask traces of earlier farming (Harding and Gingell 1986). This aerial photograph also shows a large hollow (4.6m) in the southern end of the barrow. This probably represents either unrecorded antiquarian investigation or medieval/post-medieval chalk extraction from the mound. Despite this considerable damage, the mound remained up to 1.2m high in 1963 prior to excavation but has since been flattened for cultivation (Harding and Gingell 1986). At WS1 the south-east ditch is mostly infilled, possibly as the result of later constructions including part of a co-axial field boundary (Bax et al. 2010, 6). DUR24 is situated within the military buildings of Larkhill Camp and is reported as having been damaged by ploughing and military activity (NMR number: SU 14 SW 23). Further afield in the SPTA, NET6 appears to have been slighted by co-axial fields (McOmish et al. 2002, 24), but most other long barrows in the SPTA do not appear to have been ploughed until recently (McOmish et al. 2002, 21). As discussed above, dating the levelling of WS71 is difficult given the limited nature of the interventions, but appears to be Late Bronze Age, whereas the levelling of WS86 may have occurred earlier. It is difficult to date the levelling of long barrows elsewhere in the area from stratigraphic evidence owing to a lack of modern excavation. 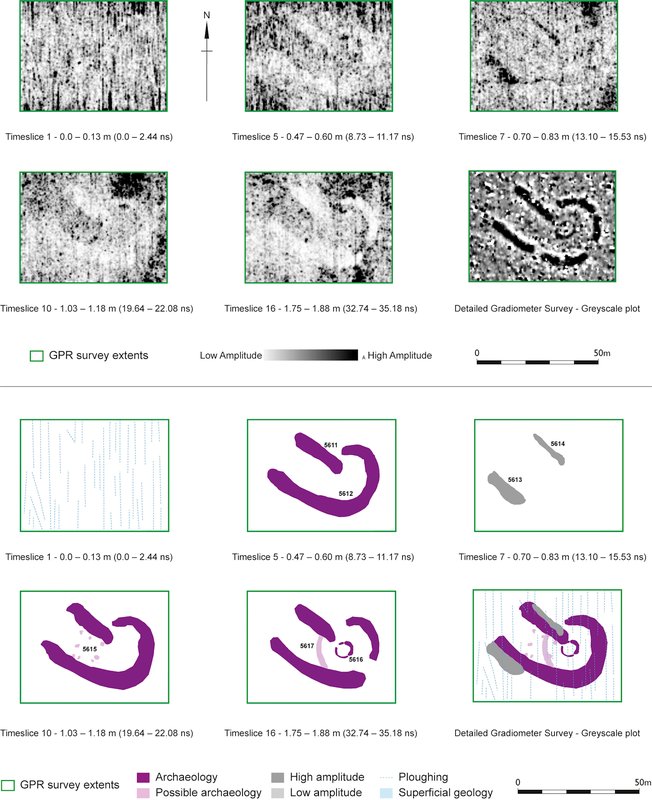 More evidence may be obtained by looking at the features mapped from aerial and geophysical survey (Linford et al. 2015; Barber and Small in prep; Figure 1). The area around WS71 and WS86 is densely covered by crop marks of an extensive co-axial field system, elements of which appear to be cut by a major Wessex linear ditch running alongside Diamond Wood (a-a in Bowden et al. 2012, fig. 4.18), the ditch itself being aligned between WS1 and WIL41. The relative size of various banks on aerial photographs also suggests that the field system began as a smaller number of larger, more dispersed divisions, and became further subdivided over time. A pronounced concentration of Romano-British pottery retrieved from surface collection strongly suggests that the field system remained in use into the Roman period and was actively manured, possibly by a community living nearby to the west in the Romano-British settlement on Oatlands Hill (Richards 1990, 25–27). Other work by this project has demonstrated that the earlier phase of the field system was probably laid out with reference to a palisaded ditch, which was decommissioned sometime after 1440–1270 cal BC (2σ; SUERC-66780; Roberts et al. 2017). WS71 appears to have been respected by the earlier phase of the field system, but is intersected by the possibly later subdivisions. The apparent Late Bronze Age date of the infilling of the long barrow ditches fits with this interpretation, providing a plausible terminus post quem of Late Bronze Age or later for the subdivisions. WS86 is also avoided by the apparent earlier phase of the field system, and intersected by later divisions, but the absence of any post-Neolithic material from its ditch fills raises the question of whether the monument may have been decommissioned long before fields were established across its location. A wider consideration of the treatment of long barrows by later communities may provide insights into the post-Neolithic histories of WS71 and WS86, as well as into the landscape development of the WHS. We have already discussed how two long barrows appear to have been used as landmarks when a major linear ditch was being created across Wilsford Down (Bowden et al. 2012). Other long barrows are also incorporated into Bronze Age ditch systems, such as WIL34 (Bowden et al. 2012; Linford et al. 2015; Roberts et al. 2017), and yet more form the basis for major round barrow cemeteries that pre-date the major ditch systems (WS1, WIL13, WIL41; Bax et al. 2010; Field and Pearson 2011; Bowden et al. 2012), or sparser/smaller barrow groups (AM7, AM10a, AM14, WIL34 and possibly WIL30; Barrett and Bowden 2010; Field and Pearson 2011; Bowden et al. 2012). AM42 does not appear to be associated with the Old King Barrows, but this remains possible; they are closely aligned. FIG31 appears to be respected by the northern edge of another later prehistoric field system mapped from aerial photography. NETB, DUR24 and BUL1 remained in isolation, but extant, while DUR76 and AM140 are not visibly overlain by later features on aerial mapping or geophysical survey (geophysical survey has only been undertaken at the latter; Wessex Archaeology 2016a; Figure 11), but have been entirely flattened by later, presumably agricultural, activity. In contrast, WIN53, WS71 and WS86 are all truncated by later prehistoric field systems on the western side of the SWHS, and NET6 similarly to the north, although it has not been quite so completely ploughed out and a slight mound remains (McOmish et al. 2002, 23, 25). 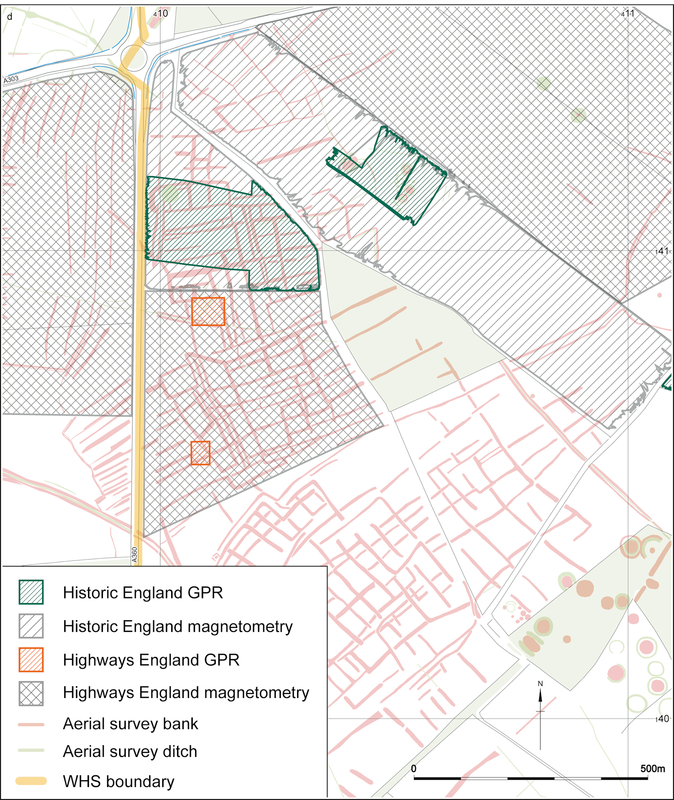 Our review highlights a difference between the SWHS and the SPTA in the role of earlier monuments in round barrow cemeteries. At least seven examples of long barrows associated with later barrow cemeteries exist in the SWHS, whereas none of the subset of the SPTA long barrows reviewed for this article can be even generally considered to be a focus of later barrow construction. Notably, in the entire wider SPTA study area, the only other examples of long barrows being incorporated into round barrow cemeteries are at Knook Barrow, the two barrows associated with the Milston Firs long barrow, and the Snail Down barrow complex, which appears to be based around an oval barrow, a form that is omitted from the class of long barrows in the SPTA volume on the basis that it may be later, although the limited evidence for this assertion is discussed above (McOmish et al. 2002, 23, 40–44). Thus, only two examples from twenty-eight long barrows defined by the SPTA project are part of later cemeteries, whereas at least seven of the twenty-one (33%) included in this study are associated with later cemeteries; five barrows appear in both datasets. Within the SWHS, this rises to at least seven from thirteen (54%). All of these examples are either within the 'Palisade/Gate complex' discussed by Bowden et al. (2015, 72–74) and named by Pollard et al. (2017) (AM7, AM10a, AM14, WIL13), or to the east of Wessex linear AM1010837 (WS1, WIL34 and WIL41; the linear is a:a in Bowden et al. 2015, fig. 4.18). It is therefore clear that long barrows within the core Stonehenge landscape were preferentially incorporated into round barrow cemeteries in comparison with those beyond, both within the modern SWHS and further afield in the SPTA. This is not the simple result of a lack of round barrows in the SPTA when compared to the SWHS; both contain dense concentrations of round barrows, primarily concentrated in the SPTA between the Till and Avon rivers (Lawson 2007, 202), similar to the riverine distribution pattern of long barrows in the Wylye valley (Eagles and Field 2004). This pattern of differential treatment of long barrows by builders of round barrows clearly demands explanation. Various scholars have argued strongly that round barrow cemeteries were constructed within sight of Stonehenge in order to link these monuments with the already ancient site (Exon et al. 2000; Needham et al. 2010), but it is also now clear that long barrows in this landscape provided foci for round barrow cemeteries more than would be usual elsewhere in the region. WIL41, AM7, AM10a, AM14, WIL13 (associated with round barrows), AM42, DUR24, FIG31, FIG27 (unassociated with round barrows) are visible from Stonehenge (Exon et al. 2000, 54), whereas WS1 and WIL34 (associated with round barrow cemeteries) and all other long barrows (all unassociated with round barrow cemeteries) are not. Notably, no long barrow visible from Stonehenge has been completely ploughed out, whether in prehistory or since, although a few have apparently been considerably reduced. Exon et al. (2000, 69-72) demonstrate that early round barrows containing Beaker pottery in the SWHS are associated with a range of earlier monuments, including henges, the Greater Cursus and long barrows, and that later, more numerous, round barrows containing 'Wessex' style artefacts are more focused around Stonehenge. Although we accept the underlying argument that the placement of these monuments derives from a motivation to reference the past, this fails to explain the contrast with the SPTA. The outstanding difference between the SWHS and the SPTA in terms of Neolithic and Early Bronze Age monuments is unquestionably Stonehenge. We would argue, therefore, that the motivation derived from a series of landscape relationships between these long barrows and Stonehenge. The evident familiarity of Early Bronze Age communities with complex social grammars of burial mounds and the insertion of Beaker burials in AM14 and WIL34 (Bowden et al. 2015, 50) strongly suggest that long barrows were perceived as ritual monuments during the period of round barrow construction. Although Stonehenge continued to be considerably modified through the Beaker period (Darvill 2016, 91), the origins of both the long barrows and Stonehenge were at least five centuries earlier. The first location and earliest phases of construction of Stonehenge may have begun to be mythologised, and the relative chronological origins of Stonehenge and long barrows may have become entangled as narratives of the monuments developed. Although the chronologies involved are relatively short, the repeated physical remakings of Stonehenge surely imply considerable accompanying narrative remakings? In view of such potentially intensively manipulated or mythologised chronologies and narratives, it is entirely possible that associations were made between the people interred in long barrows, and the origins of Stonehenge. If we accept that the placement of round barrows within view of Stonehenge was an attempt by Early Bronze Age communities to forge a connection between new burial monuments and the ancient monument, and possibly stake some form of territorial claim through doing so (Needham et al. 2010, 31–33), we must also consider whether these motivations and connections may also have been assigned by these communities to the builders/inhabitants of long barrows in similar locations around Stonehenge. Yet as discussed above, not all the well-preserved long barrows chosen for incorporation into round barrow cemeteries are visible from Stonehenge. The vital insight in resolving this problem is provided by the deep engagement with the SWHS landscape of Exon et al. (2000, 88–90), who suggest that the dry valley running from Springbottom Farm up between Wilsford Down and Normanton Down may have been an important approach route to Stonehenge during the Early Bronze Age because of its proximity to the Normanton Down barrow group. Although Stonehenge is ringed by large round barrow cemeteries, the Normanton Down cemetery stands out in terms of the wealth of the interments and its chronology, with no activity beyond Wessex Period 3 (Needham et al. 2010, 33). The long barrows of WS1 and WIL34 — the only long barrows associated with round barrow cemeteries in the SWHS not visible from Stonehenge — are highly visible from this valley approach route. We can therefore hypothesise that long barrows were selected as locations for the construction of round barrows on the basis of their visibility from Stonehenge, but also on the basis of their visibility from an important Early Bronze Age approach to Stonehenge. This dimension of the treatment of long barrows, when considered alongside the differential treatment of long barrows within and beyond the visual envelope of Stonehenge, indicates a subtler Bronze Age view of the history of the Stonehenge landscape than if each long barrow is considered individually. It becomes clear that the mere existence of a long barrow in the area, even quite a large monument such as WS71, was insufficient to prevent its removal or incentivise its adoption as the basis for a round barrow cemetery. While some long barrows away from Stonehenge in the wider landscape do show the development of such cemeteries, of the thirty-one long barrows beyond the SWHS considered for this review and/or by the SPTA study, only two are developed in this way. In contrast, at least seven of the thirteen within the SWHS are associated with round barrow cemeteries. This suggests that it was the existing link between these long barrows and Stonehenge or routes to Stonehenge — as understood through Early Bronze Age conceptions of memorialisation, territory and ancestors — that gave them their significance, not only their individual attributes as monuments, or the mere fact that they were probably understood to be the funerary monuments of past inhabitants of the landscape. As the Bronze Age continued, the landscape was divided up, with earthworks apparently formalising a central funerary landscape, incorporating long barrows into yet another stage of landscape change. Long barrows such as WS71 and WS86 which had not been incorporated into round barrow cemeteries and were out of view from Stonehenge were destroyed sometime during or after the Late Bronze Age. While some such long barrows survived the agricultural depredations of later prehistory, particularly in the east of the SWHS and on the SPTA, they remained vulnerable to the plough in later periods, although it is generally difficult to date this destruction. Those long barrows that became part of round barrow groups provided a more formidable combined obstacle to ploughing, one that was perhaps easier to incorporate into woodlands, pastures or plantations, than to remove. The current survival of long barrows in the SWHS is therefore heavily mediated by Bronze Age conceptions of ancestors, territoriality, and the already mythical past of Stonehenge and its landscape.